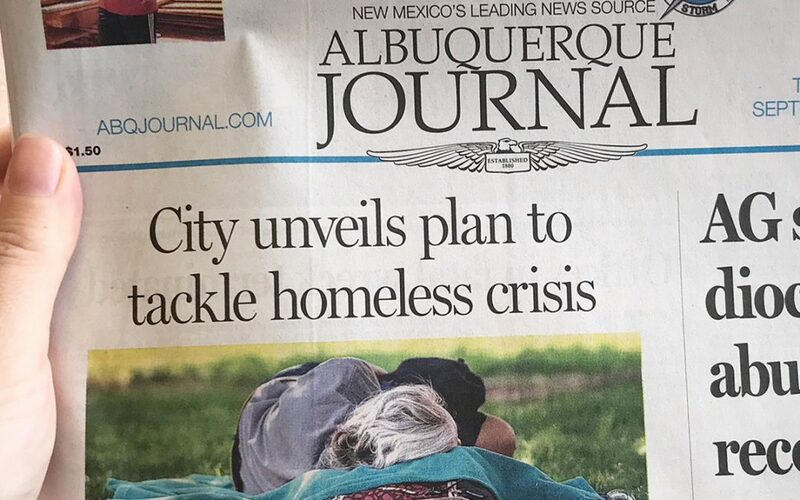 Heading Home is proud to be an integral part of the City of Albuquerque’s plan to tackle the increasingly visible issue of homelessness in our community. On the heels of an Albuquerque Journal editorial that stressed the need for a “unified plan” to help this population, the City has announced a strategy in which Heading Home plays a major role. Heading Home was awarded the bid to operate the Westside winter shelter last year after successfully operating the Albuquerque Opportunity Center (AOC) men’s emergency shelter for 14 years. The organization took on the additional shelter with the agreement that the City, Heading Home and other homeless service agencies would work together to extend operations to a year-round, 24-hour facility, and work to move the facility to a more viable location. Albuquerque has historically seen an increase in homeless encampments upon the seasonal close of the facility as shelter residents reoriented themselves after having lived in emergency housing for four months. Another major focus of the City’s plan is housing vouchers, which are a critical part of Heading Home’s Housing First approach. A UNM cost study of the Albuquerque Heading Home program, commissioned by the City of Albuquerque, showed it’s cheaper to house the chronically homeless than it is to allow them to remain unhoused. The program was shown to have saved taxpayers nearly $5 million in the 2-3 year study period. Housing First prioritizes those most in need on the streets and then provides them permanent supportive housing that includes case management services. Heading Home will also be working with the City in the creation of the new Downtown Public Safety District and has recently launched a new street outreach program that focuses on individuals experiencing homelessness who are the highest utilizers of emergency services. The City of Albuquerque’s new plan continues a long history of collaboration with Heading Home and other service partners invested in evidence-based approaches to helping those most in need in our community. We look forward to building on this strategic and successful partnership.